Time requirements in modern metering applications have massively increased in the last few years. The usual requirement in modern metering applications is a time offset of 1 hour after 7 years. It should also be possible for the operating temperature range of the application to comply with this value. 1 hour max. after 7 years corresponds to a frequency tolerance of ±16 ppm absolute at 32,768 kHz. 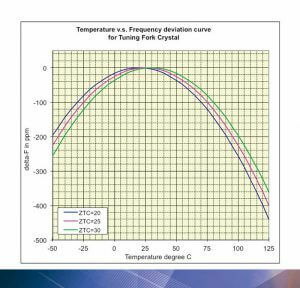 It is no longer possible for conventional 32,768 kHz oscillating crystals to meet these requirements. On the one hand, this is because 32,768 kHz are only available with a frequency tolerance of ±10ppm at +25°C, on the other hand, the temperature stability over a temperature range of -40/+85°C is more then -180 ppm. Moreover, ageing of approx. ±30 ppm after 10 years must be taken into account when calculating accuracy. In the worst case, a 32,768 kHz crystal has a maximum frequency stability of +40/-220 ppm (including adjustment at +25°C, temperature stability and ageing after 10 years). External circuit capacitance must be able to compensate any systematic frequency offset caused by the internal capacitance of the oscillator stage of the IC to be synchronised and by stray capacitance. The selection of a layout without external circuit capacitance for the 32,768 crystal involves a great risk because the accuracy of the 32,768 crystal can neither be corrected nor adjusted to suddenly changing PCB conditions during series production. Initially, the intersection angle for the 32,768 crystal was designed for optimal accuracy in wristwatches, and not for most of the applications for which it is used nowadays. In order to meet the highly accurate time requirements, we as a clocking specialist offer the series ULPPO ultra low power 32,768 kHz oscillator. This oscillator can be operated with each voltage within a VDD range of 1.5 to 3.63 VDC. The specified current consumption is 0.99 µA. The temperature stability of ULPPOs is ±5 ppm over a temperature range of -40/+85°C. Frequency stability (delivery accuracy plus temperature stability) is ±10 ppm, and ageing after 20 years is ±2 ppm. Thus the maximum overall stability of ULPPOs is ±12 ppm including the ageing after 10 years. These are industry best parameters. No external circuit capacitance is required for the circuiting of the ultra small housing (housing area: 1.2 mm2). The input stage of the IC installed in the ULPPO independently filters the supply voltage. Compared to crystals, ULPPOs save a lot of space on the printed circuit board so that the packing density can be increased, and smaller printed circuit boards can be designed. The adjustment of the amplitude further reduces the power consumption of the ULPPO. For space calculations, both external circuit capacitances for a crystal on the printed circuit board must also be taken into account. With its two external circuit capacitances, even the smallest 32,768 kHz crystal requires more space on the PCB than ULPPOs do. Moreover, very small 32,768 kHz crystals have very high resistances which usually cannot be safely overcome by the oscillator stages to be synchronised because the oscillator stages of the ICs or RTCs to be synchronised have very high tolerances as well. Therefore, sudden response time problems in the field might occur which can be ruled out with ULPPOs. Thus, the safe operation of the application is possible with ULPPOs under all circumstances. Oscillator stages consume a lot of energy to keep a 32,768 crystal oscillating. Usually, the input stage of the MCU can be directly circuited with the LVCMOS signal of the ULPPO (usually Xin). Thus the input stage of the MCU can be deactivated (bypass function) so that the energy saved can be used for the calculation of the system power consumption of the meter. Moreover, ULPPOs are able to synchronise several ICs at a time. Due to the very high accuracy of the ULPPO, less time synchronisations are required, which also saves system power. 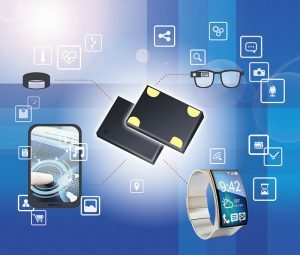 Of course, ULPPOs can be used in any applications which require miniaturised ultra low power 32,768 kHz oscillators such as smartphones, tablets, GPS, fitness watches, health and wellness applications, wireless keyboards, timing systems, timing applications, wearables, IoT, home automation, etc. Due to the high degree of accuracy of 32,768 kHz oscillators, the standby time or even the hypernation time in hypernation technology applications can be significantly increased so that a high amount of system power can be saved due to the significantly lower battery-intensive synchronisation cycles. Thus the 32,768 kHz oscillator is the better choice compared to 32,768 kHz crystals. Ultra low power 32,768 kHz oscillators are available with diverse accuracy variations – see also the ULPO-RB1 and -RB2 series. Our highly experienced specialists can quickly provide the best possible specific support for the integration design of this highly innovative component.